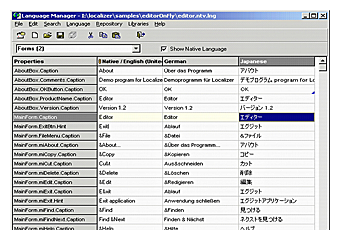 Localizer is a set of Delphi wizards and components which make your applications really multilingual and helps you to translate your programs to other languages. It can work with any string resources in your project: properties of components on the forms, resource string constants, VCL messages and the messages from third-party packages. The support for additional languages can be added without recompilation of the project, even by your "end users". Localizer is compatible with all Delphi or C++ Builder versions starting from 6.0 and higher (including the latest Delphi versions as soon as they are released). Version 3.x of Localizer can be used with Delphi 3-5 as well. 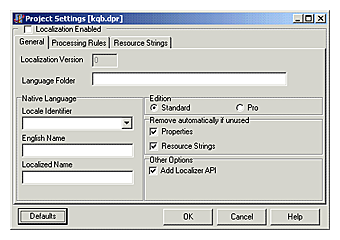 Localizer can use both standard resource DLLs or special "language files" to store localized resources. 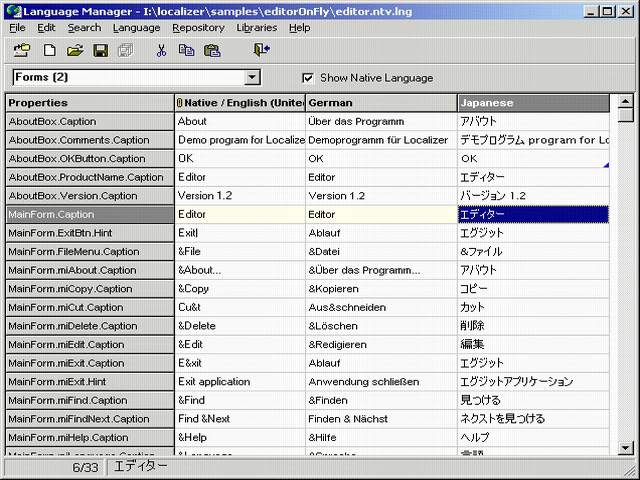 This dialog allows to setup basic project localization parameters. First of all there is "Localization enable" checkbox. If the project is not localized then this checkbox is the only available option. If you mark it and close the dialog with "OK" button then the wizard starts scanning your project and creates native language file (file that contains all project resources in original program language). 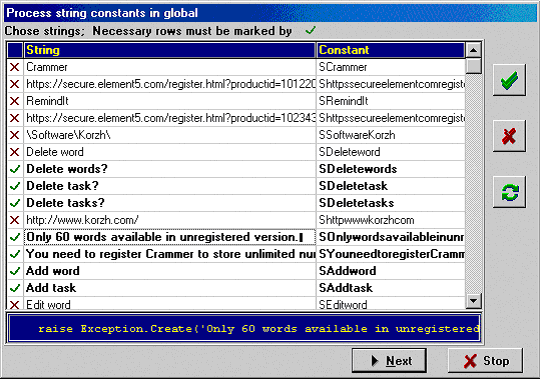 String constants located in the resourcestring section are automatically processed by Localizer. However your source code may contain other string constants ("hard-coded" strings) which are to be translated. Localizer has an ability to scan unit's source code and extract string constants to resourcestring section. 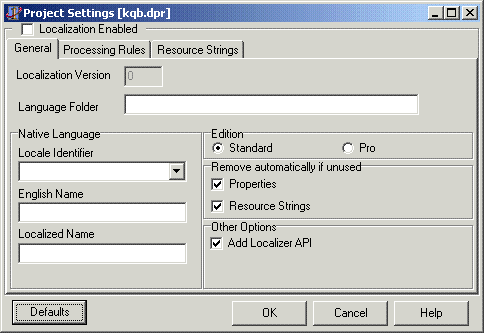 This task is implemented by the special expert "Resource String Wizard" (see figure) which can be called through "Scan .PAS/.CPP" menu item. Language Manager is the main translation environment that allows to create new translations (language files) and modify existing ones. It is totally separate program which can be freely distributed to third-party translators or end-users of your application. 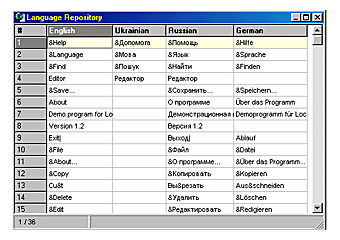 Another useful feature of Language Manager environment is Language Repository. 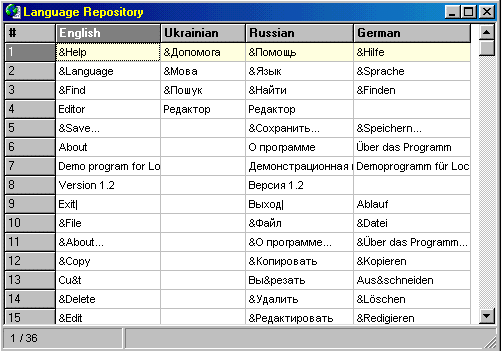 The Repository is a multilingual dictionary that can be filled by the user (translator) and is served for (semi) automatic translation. This tool is especially convenient for the translators, which translate several applications with the similar interface elements.